30/11/10: I'm uploading this purely for historical interest. 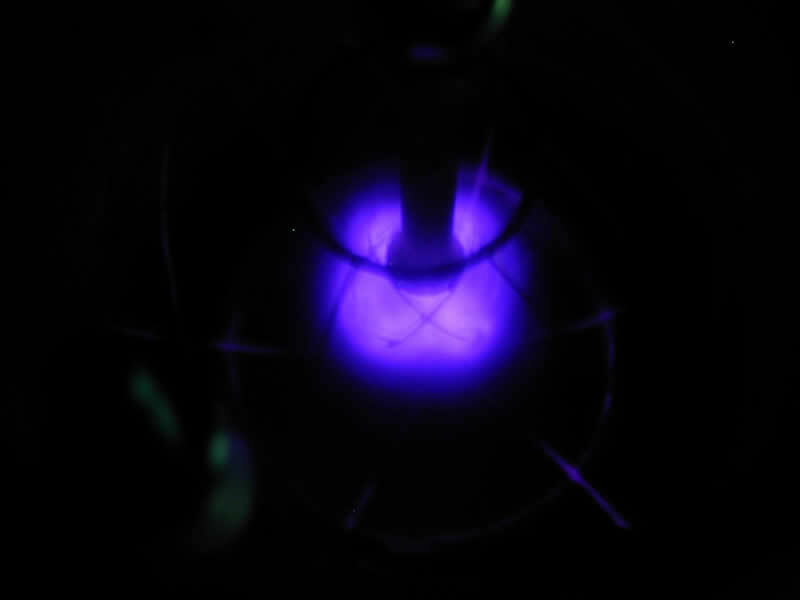 There's some nice pictures of plasma discharges with two spherical grids, but I never tried it with anything other than air. 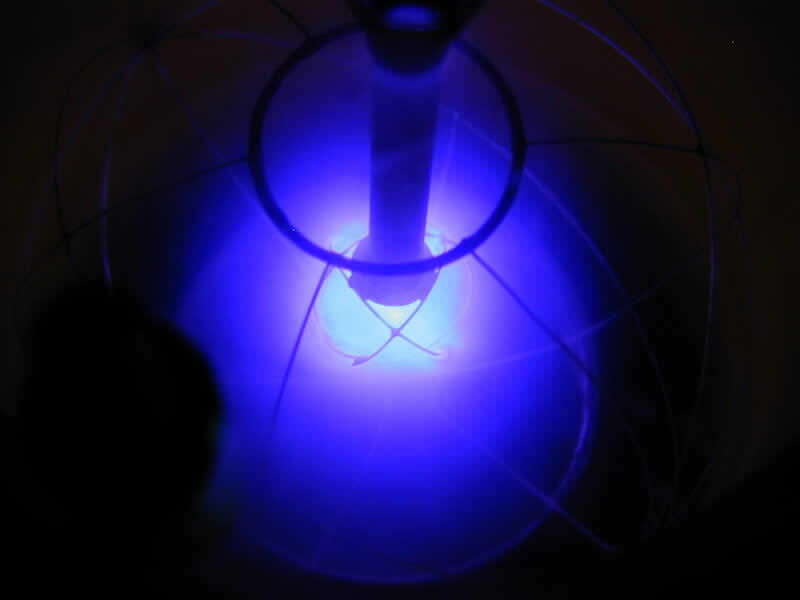 The fusor is a device to generate a small blob of superhot plasma using inertial/electrostatic confinement. 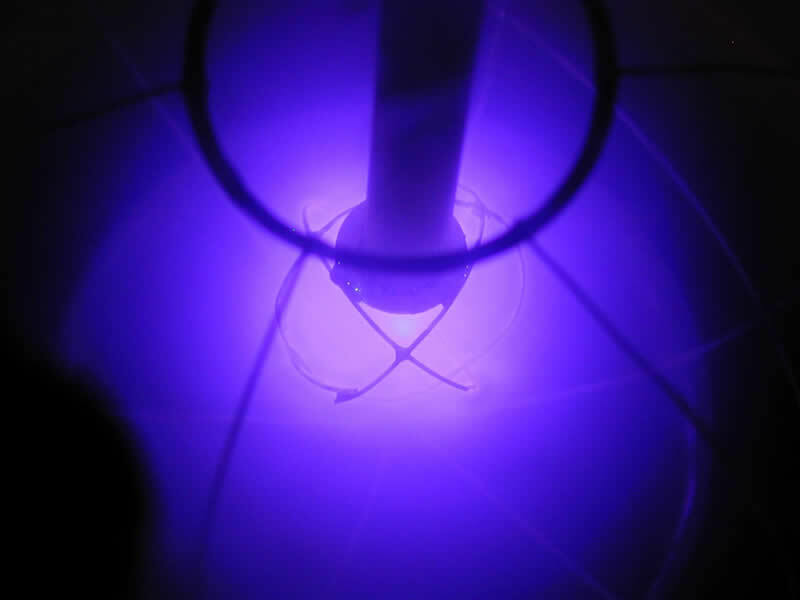 By using deuterium gas (deuterium nucleus is identical to hydrogen except for 1 extra neutron), it is said that fusion can start inside the plasma. 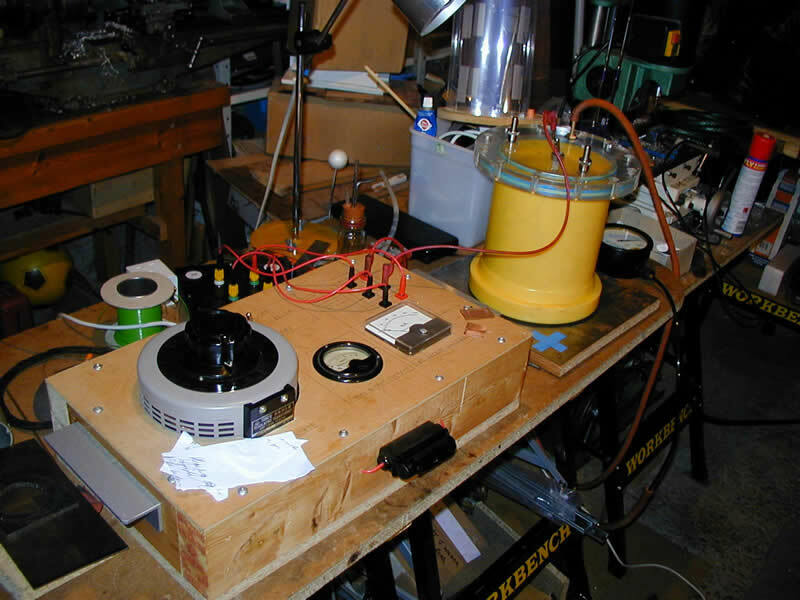 For a full description and construction details see Richard Hull's 634fusor.pdf. Or, you can just enter "hirsch fusor" into Google. By the way, I don't know if I'm allowed to put Richard's file on this website, so if I shouldn't, email me and let me know! This fusor was built using soft-soldered copper wire for both grids (mainly because I don't have a convenient way of joining steel wire). As a result, the inner grid melted to pieces after about 10 seconds of operation! It proved the principle though. Pictures are shown below - see further down for descriptions. 1) General setup. Power supply is on the left (in the big wooden box). Vacuum chamber is the bit of yellow pipe (courtesy of British Gas PLC!!). Vacuum pump is down on the floor to the right. PSU can deliver 100mA @ 1kV. Inner grid is NEGATIVE. PSU has no current limiter so it's down to skilful twiddling of the variac to adjust the current within limits! 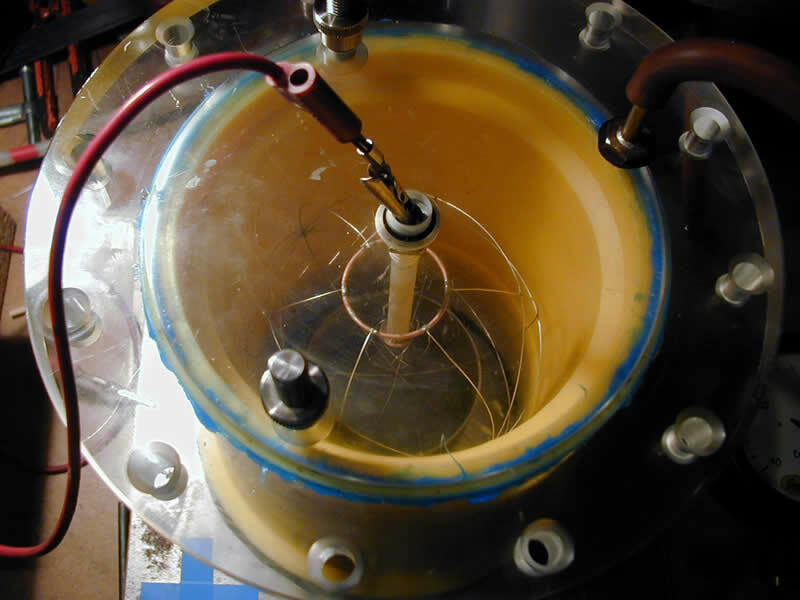 2) Close-up of vacuum chamber. Note: The nice perspex lid came from a skip at university and just happened to fit over the end of the pipe EXACTLY!! The two grids are visible, the inner one connected to a modified NGK spark plug which acts as a great electrical feedthrough. 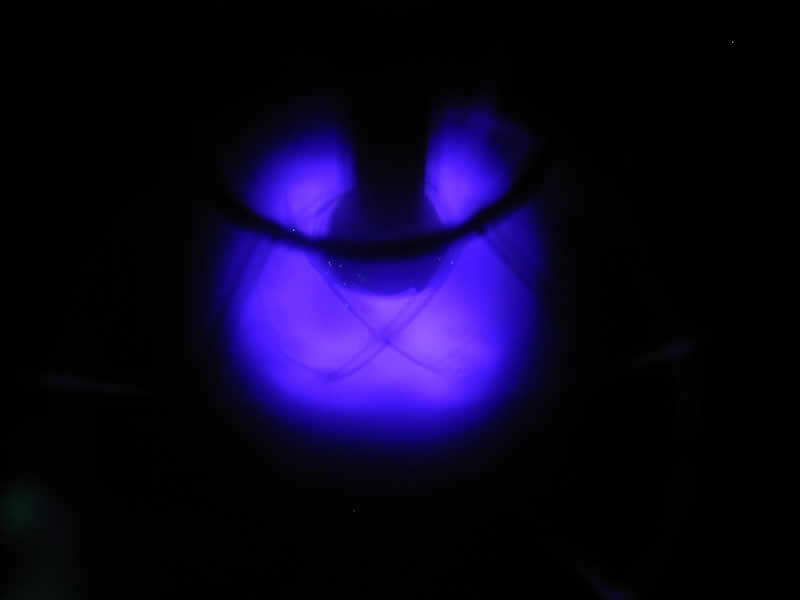 3) The rest of the pictures are of the plasma ball inside the inner grid. Some are blurry because the digital camera decided to take a long exposure time and I moved during the exposure. 4) Another picture of plasma ball. 5) Yet another picture of plasma ball. 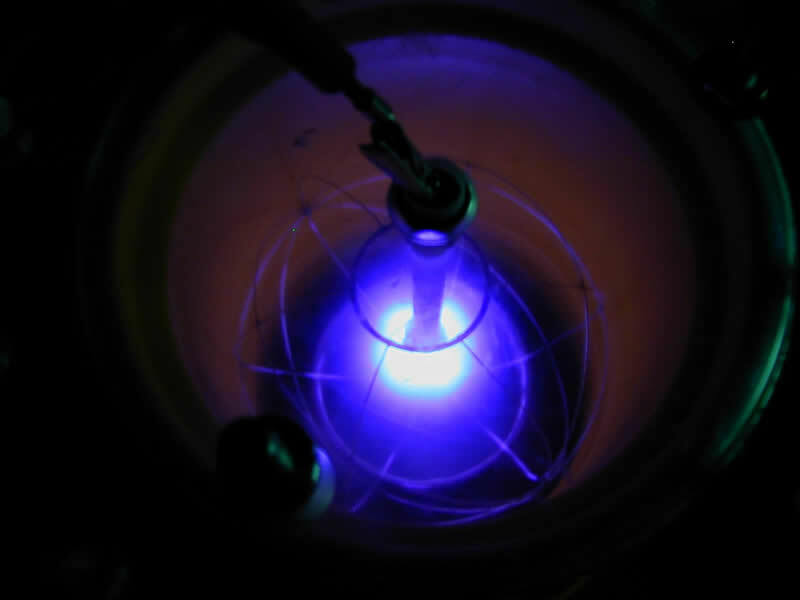 6) Good picture of plasma ball! This was running at 200mA (meter was off-scale) @ 1kV. 7) Another good picture of plasma ball, but blurry. 8) Diagram of grids drawn using Povray.